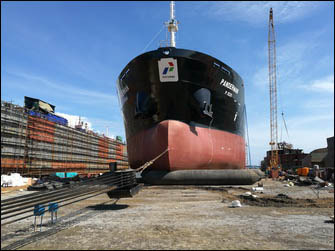 Indonesian shipyard, PT Daya Radar Utama launched one DWT 17500 oil tanker, named MT. 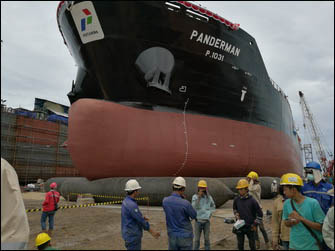 Panderman, the first unit of eight-series ships ordered by Pertamina in his Lamongan yard on 2nd December 2016. MT. Panderman with 6200 MT lightweight and 157-meter length, 28-meter width, 12-meter height was launched into Jawa sea with 39 pieces marine airbags which have 2 m diameter by 18 m long. Pertamina is an Indonesian state-owned oil and natural gas corporation based in Jakarta. The firm is the second-largest crude oil producer in Indonesia and ranked no. 122 in the Fortune Global 500 list of companies with revenues totalling to $70.9 billion in 2013. 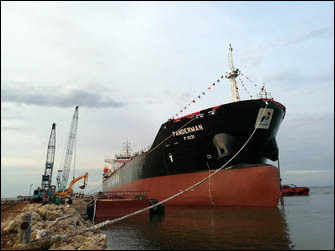 One of the efforts conducted by the state-owned oil and gas company is to order tanker vessels from domestic shipyards. “We challenge domestic vessel industry to build eco-friendly tanker vessels with high safety rate complying international regulations for Pertamina. The tanker vessel order is in line with long-term business plan to reinforce our BBM distribution fleet,” Wianda , the Pertamina Corporate Communication Vice President, noted in Jakarta. PT Daya Radar Utama (DRU), proved his capacity and capability by successfully built the MT Musi for Pertamina, one 3,500-DWT oil tanker with 90-meter length. That success has sparked big vessel orders to the company, including DWT 17500 tankships . The launching design and operation of MT. Panderman were supervised by Eversafe Marine Engineering company, who is a famous integrated solution provider of airbag ship launching and dry docking. 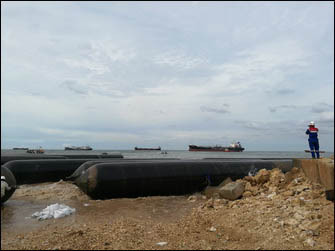 His group company Evergreen Maritime offered 44 pieces marine airbags for the tanker launching. 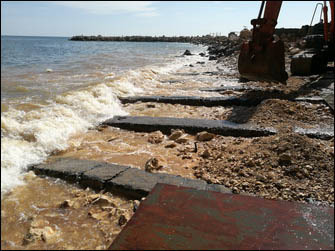 “Basing on the calculation, the oil tanker was moved 40 meters ahead and ballasted 800 tons water before the launch. The actual launching weight of ship reached 7000 MT, total 39 pieces Evergreen marine airbags with 2 m diameter and 18 m length were deployed. On three PM of 2nd December, MT Panderman was smoothly launched into the sea without any surprise. We believe good preparation work is vital for the success of airbag launching and we are proud that our company keep 100 percent success record for the past 10 years.” Added by Song Tao. Shipbuilding and repair business is flourishing in the archipelago. 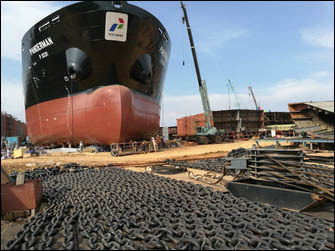 DRU Lamongan yard has orders of 12 new vessels waiting for building. A ship repair yard, adjacent to DRU, all his slipways are fully occupied, a mile away at least 5 ships are queuing. Chinese ship launching airbags make contribution to the boom surely, in most Indonesian shipyards you can find those black sausage-shape-balloon .